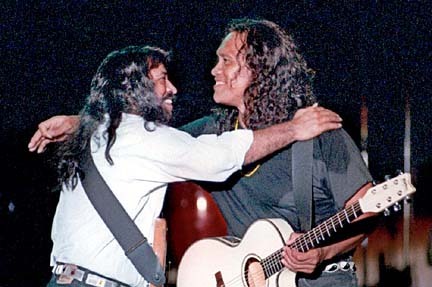 Cecilio and Kapono's "Thirty Years of Friends -- Lifetime Party" is up for several awards, including Na Hoku Album of the Year. The duo was photographed, top, at a reunion concert. Amy Hanaiali'i Gilliom and Willie K are listed on the ballot as a duo rather than as a "female vocalist," and Keali'i Reichel is back with a vengeance, as the Hawaii Academy of Recording Arts announces the finalists for the 2004 Na Hoku Hanohano Awards. The ballot goes out to the HARA membership today. The winners will be announced at the annual awards show in May. 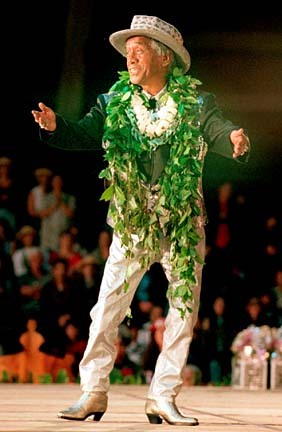 The personable and ever-popular Reichel has a pace-setting 10 nominations for his long-awaited album "Ke'alaokamaile," including Male Vocalist of the Year, Album of the Year, Hawaiian Album of the Year and Hawaiian Language Performance. First-time recording artist Kainani Kahaunaele makes one of the strongest debuts of recent memory with seven nominations for her album, "Na'u Oe," including Female Vocalist of the Year, Album of the Year, Hawaiian Language Performance and Most Promising Artist. 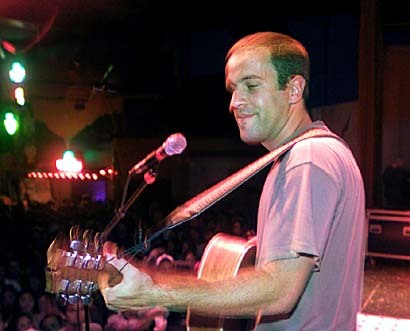 Local-boy-turned-national recording artist Jack Johnson is nominated in the Rock Album category. 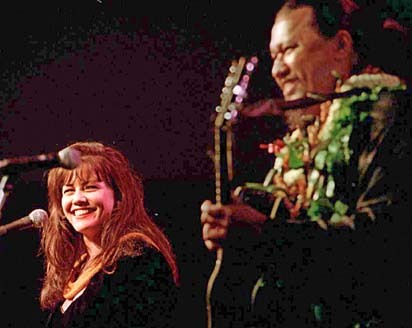 Amy and Willie, who were the focus of controversy in 2000 when a change in HARA rules allowed them to compete and win in the Female Vocalist category a year after they won Group of the Year honors, are finalists in four categories, including Group of the Year. Two Star-Bulletin staffers are also on the final ballot. 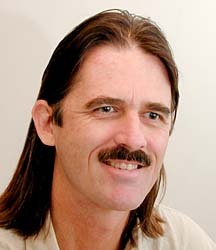 Mark Coleman, whose current album, "Outside the Circle," was voted Country Album of the Year at the Hawaii Music Awards earlier this month, is one of five finalists in HARA's Rock Album category. He'll be up against Chance & the Blues Daddies, Jack Johnson, Sugah Daddy and Dave Seawater. Gary C.W. Chun, features writer and editor of our weekend entertainment section, is a finalist in the Liner Notes category for his annotation of Noel Okimoto's "Ohana" album. The HARA membership vote determines the winners in 21 categories. A panel of Hawaiian music and language experts selects the final nominees and winners for the Haku Mele and Hawaiian Language Performance awards. The winner of the Favorite Entertainer Award will be determined by public voting at Borders beginning next month. The 27th Annual Na Hoku Hanohano Awards show will take place May 24 at the Hilton Hawaiian Village, with part of the proceedings televised live starting 7:30 p.m. on KFVE-TV. Tickets for the dinner and show are $95 per person. Call 235-9424 for reservations. Amy Gilliom, left, and Willie K are nominated in the Group of the Year category, among others. Mark Coleman: Nominated in the rock album category for "Outside the Circle"
Veteran performer George Na'ope is up for the Hawaiian Contemporary Album award.